A quick stroll down the oil aisle at your favorite auto parts store can be overwhelming. There are literally over 100 different options to choose from. Two of the most common oils you’ll encounter are 5w30 and 10w30. 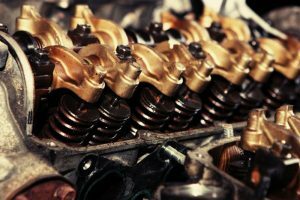 In this article we break down the difference between the two and help you decide which one is right for your engine. Most cars and trucks on the road today use multi-grade oil. Both 5w30 and 10w30 are multi-grade products. This means they are designed to perform at both cold starting temperatures and normal operation temperatures of 210° F without sacrificing performance. The first number in the viscosity grade is the low temperature, winter rating (i.e. 5w and 10w). In fact, that’s what the “W” stands for: Winter. Multi-grade oils are designed to be thin in cold weather so your engine gets the protection it needs while the engine is still warming up. The second number in the viscosity grade is the high temperature rating (i.e. 30). The viscosity is measured at 210° F to represent the normal operating temperature of an engine. When trying to decide between 5w30 and 10w30 you’ll need to consider the temperatures where you live and the age of your engine. 5w30 oil is designed to operate at ambient temperatures as low as -30 degrees Celsius (-22 degrees Fahrenheit) – making it a great choice if you live in cold climates such as the Northeastern United States or Canada. 5w30 is also a great choice if you live in warm climates that reach up to 35 degrees Celsius or 95 degrees Fahrenheit. In general, 5w30 is a great multigrade oil designed to meet the demands of almost any temperature in both warm and cold climates. 10w30, however, has a smaller temperature window. The numbers on each bottle of oil (5w, 10w and 30) are representations of the product’s viscosity. Simply put, viscosity measures a liquid’s resistance to flow (aka its thickness). A higher viscosity oil, such as 10w30, will flow slower at low temperatures compared to a lower viscosity oil like 5w30. This is important because viscosity changes as temperatures change. Viscosity decreases as the temperature of the oil increases. A higher viscosity or thicker oil will seal better than a low viscosity oil. A thicker oil will also provide better lubrication of critical engine parts. Oil also plays an important role in fuel efficiency. High viscosity oils, like 10w30, are thicker which creates more drag on the engine parts and reduces engine performance. This additional resistance caused by the oil can increase fuel consumption and reduce fuel efficiency. 5w30 is a great multigrade oil for use in low starting temperatures as well as high summer temperatures. It is also more fuel efficient since it creates less drag on the bearings and moving engine parts. 10w30 is thicker and may provide better sealing capability for older engines. As engines get older, their clearances widen and require a thicker oil for better protection. That being said, you should always use the engine oil specified in your owner’s manual.